With Mother's Day just under two weeks away, it is time to get your online gift orders placed so that they will arrive in time to surprise that special mom on her day. This year Mother's Day is Sunday, May 13. Whether you know a brand new mom, empty nest mom or grandmother, it is nice to make them smile on this recognized day of celebration of mothers. All items listed in my EDCCollective and EclecticSkeptic Etsy shops are ready to ship. If you see something you like, don't wait. I will be taking most of those items to a festival this Saturday, May 5. Pick out your favorite before someone in person does and give USPS the best chance of getting your order to you in a timely fashion. 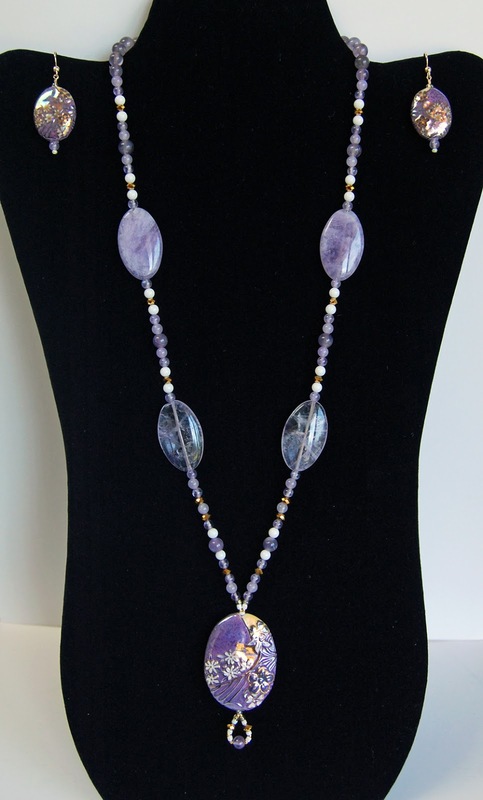 You will find a wide range of potential gifts, from jewelry and accessories to photographic art in many forms. I'm a little behind in sharing some pieces of art I have acquired over the past couple of years. One of them is another piece of gourd art. It is my second piece from Susan Ashley. I was set up next to her at a show a year or two ago and one piece caught my attention early on. While she sold several pieces of her work that day, this piece was still there shortly before closing so it had to come home with me. 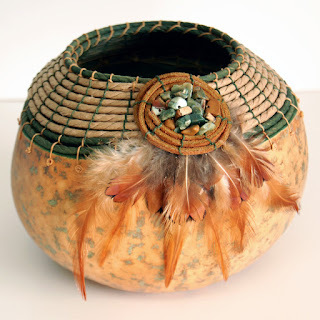 This gourd has cording woven on the top of it like my first purchase from this artist, however it has more of a Native American inspired style than the classic look of the first one. From the outside, this gourd is very natural looking with the subtle earth tone shades of the gourd, feathers, leather, stones and woven portions. 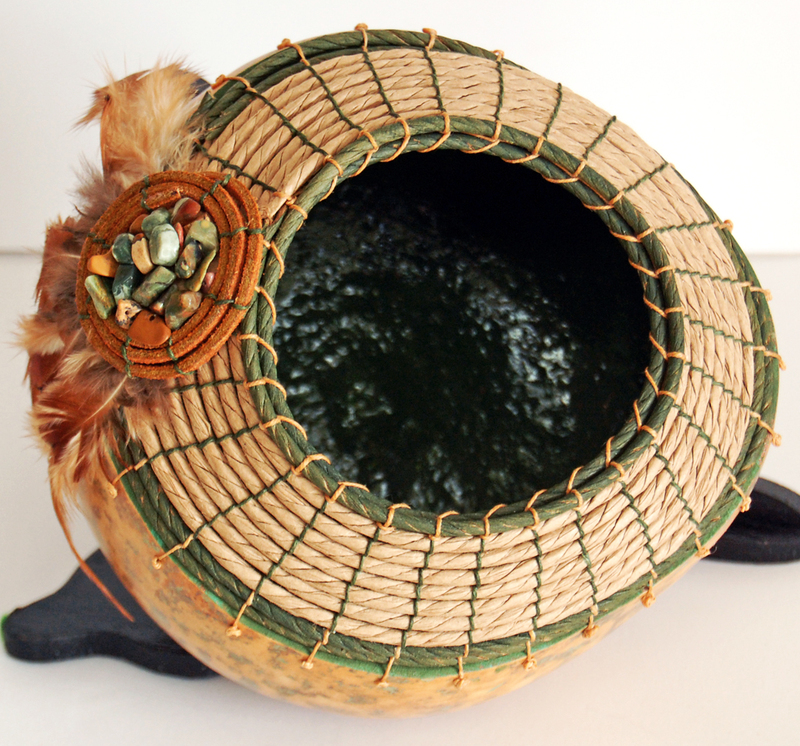 The inside holds a surprise, a beautiful, shiny dark green interior. You will be able to view eight pieces of Susan's work, including antler and pine needle baskets and some gourd art, at the Inspired by Nature exhibit coming up in Mansfield in May. Her work, along with some of mine and four additional local artists will be on display at the Mansfield Performing Arts Center from May 7-22, with a reception from 6-8pm on Saturday, May 12. Viewing hours during the remainder of the exhibit are 8am - 4:30pm, Monday through Friday. Come out and be inspired. This custom request came from a vendor I met at the first Olde Town Christmas Craft Show that I set up at. We were across the aisle from each other for a couple of years and struck up a friendship. 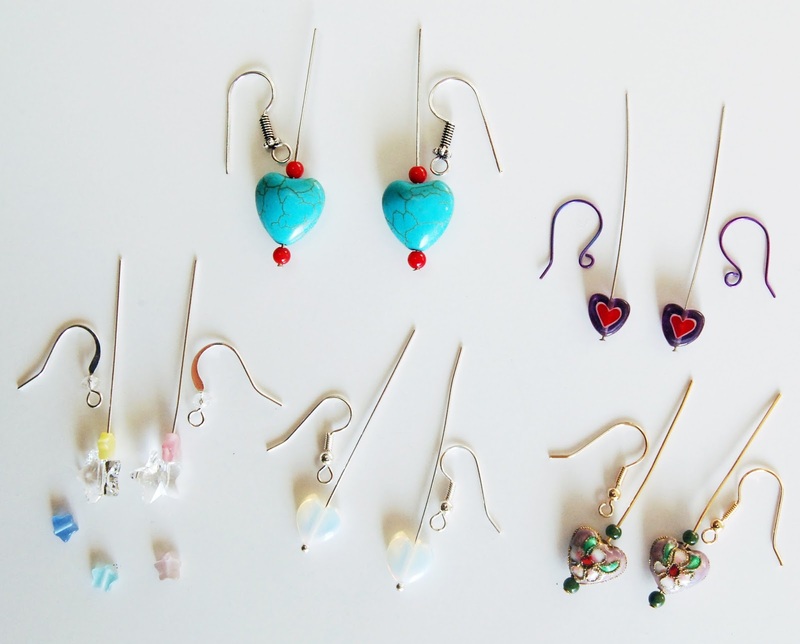 Almost four years ago I made her some custom earrings, predominantly hearts. This past year when I ran into her at a show again, she said she was interested in some more earrings. We had the chance to discuss what she was interested in when she visited me at the Happy Holidays Pop-Up Market this past December. I showed her my selection of heart beads made from a variety of materials. My friend chose hearts made from opalite, millefiori glass, turquoise colored howlite, cloisonne and some crystal stars. 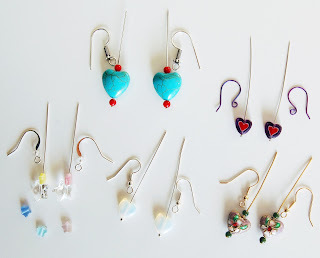 We discussed what type of ear wires she could wear and we decided that I should send her some mock ups of the beads she chose as earrings paired with complementary beads and ear wires after the first of the year. After completing the mock ups, I took pictures of them to send to her for approval. She liked the designs and chose the small yellow glass stars to go with the crystal ones. I took a picture of the completed earrings before we met and I delivered her new earrings to her. If you are interested in a custom pair of earrings, necklace, bracelet or other piece of jewelry, please contact me to see if I have what is needed to create what you are looking for.